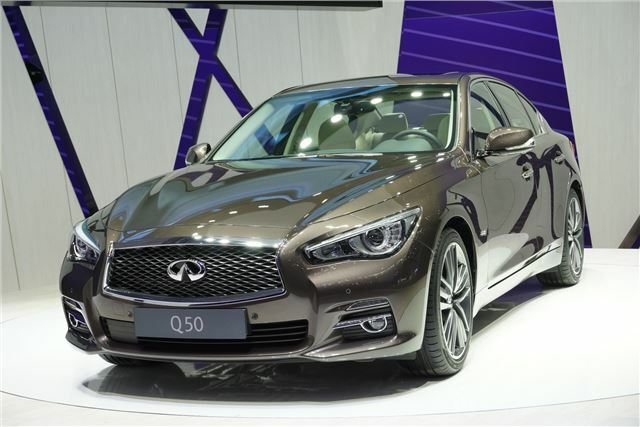 Infiniti is headlining its Geneva Motor Show line-up with the Q50, a new sports saloon. It takes its styling cues from earlier concept models like the Emerg-e and is Infiniti's challenger to the BMW 3 Series. It's due to go on sale in the UK this June. Infiniti is keeping details about the European powertrain hushed, but it will be the first model to feature technology developed specifically for Europe, the result of a partnership with Daimler. The Q50 heralds in a new naming system for all Infinintis, Q for saloons and coupes and QX for crossovers and SUVs. For the first time, Infiniti is showing a spread of cars with four and six-cylinder diesel engines, hybrid powertrains, pure electric drive systems ­– and a V8 with KERS energy recovery system in World Champion Sebastian Vettel’s Infiniti Red Bull Racing Formula One car. The Infiniti Q50 makes its European debut in 364PS 3.5 Hybrid and 2.2-litre diesel form. That's Infiniti’s first four-cylinder diesel with 170PS, 400Nm of torque and emissions starting from below 115g/km of CO2. The Q50s on the stand showcase the model’s exclusive new Hagane colours and show a variety of the features that will be available across the Q50 range – designed to appeal to company and private buyers alike.